A human resources assistant is responsible for a number of duties in direct support of the human resources department of a company. 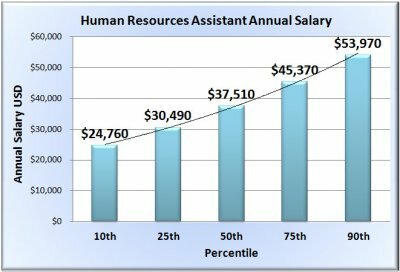 The maximum earning potential of human resources assistant varies according to level of experience in this field. Human resources assistant salary with up to 2 years of experience earns about $34,645 annually. Those with 2 to 4 years of experience earn an average of $38,412, while those with 5 or more years of experience earn $44,728 annually. In some cases, working overtime can considerably increase income. It is estimated that HR assistants in the U.S earned between 10.65 and 19.15 per hour and $15.56 to 29.47 per hour for overtime. The geographic location also affects a HR assistant salary; in Chicago the average salary range between $30,660 and $52,783 while those in South Bend earn an average of between $27,528 and $47,393. HR assistants are in most cases offered a significant benefits package such as medical, dental and vision insurance. Sometimes, they are offered paid vacations and sick pay. 77% of HR assistants receive medical benefits, 68% received dental insurance, and 51% received vision insurance while 21% did not get any benefits. According to the U.S Bureau of labor statistics, employment of HR assistants will slowly decline through 2018.